Inro, three cases. A raised lacquer representation of a cake of Chinese ink on a red ground, style of Ogawa Haritsu (Ritsuo) 1663-1747, signed Korenobu. 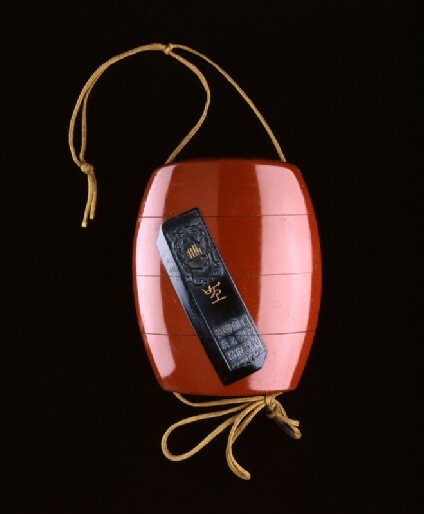 Inrō with four compartments in red lacquer with a design of two Chinese inkcakes in black takamaki-e and red and gold hiramaki-e. The interior in nashiji and fundame. Two seals on the large circular inkcake read Korenobu Zeshin. Shibata Zeshin was apprenticed at the are of eleven to the lacquer master Koma Kansai II (1767-1835) and subsequently studied painting with the Shijō school in Tōkyō under Suzuki Nanrei (1775-1844) and with Okamoto Toyohiko (1773- 1845) in Kyōto. Despite his own skill for original design, Zeshin borrowed this one from Ogawa Haritsu, known as Ritsuō (1663-1747) and used variations of it on serveral of his lacquer pieces. His sparing use of gold and his experimentation with lacquers in imitation of metals, woods and pottery, are a feature of his work. 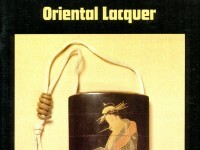 With the introduction of Western dress to Japan in 1872, the trouser pocket took the practical place of the inrō, which hung from the waist sash by means of a small toggle (netsuke). Artists, however, continued to make inrō, for their popularity with Western collectors provided a new market. After Zeshin exhibited in the Vienna Exposition in 1873, much of his work made its way into collections in America and Europe. By the end of his life he was as well known abroad as he was in Japan. In 1890, just one year before his death, he was honoured with the title Teishitsu Gigeiin (Imperial Artist), the first artist working with lacquer to recieve it.